With the arrival of a new male wolf last month, Brookfield Zoo plans to establish a new pack of endangered Mexican wolves. Zoo officials said this week they are hopeful that 2-year-old Ela and newcomer Apache, 7, will have a successful breeding season this winter and produce a litter of wolf pups in the spring. Apache arrived at the zoo in December from Albuquerque Bio Park in New Mexico. Brookfield Zoo was home to Ela’s original pack until November, when nine wolves were transferred to new homes in Missouri. Ela’s packmates were moved because as wolves mature, they typically disperse from their natal pack. The 10-wolf pack was one of the largest and most successful packs in the history of the Mexican Wolf Recovery Program, according to the zoo. Apache and Ela can be seen at the zoo's Regenstein Wolf Woods habitat. 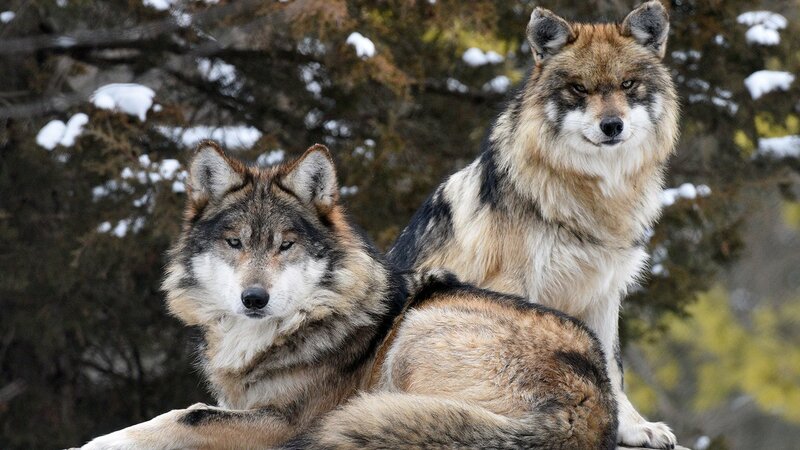 Because of the zoo’s prior breeding success, the Association of Zoos and Aquariums requested that the zoo establish the new breeding pair as part of its Mexican Wolf Species Survival Plan. Mexican wolves were once common in the southwestern U.S. but today are one of the world’s rarest species, having been nearly wiped out in the mid-1970s, with fewer than 10 remaining at one point. Starting in 1998, 11 Mexican wolves were reintroduced to the wild in Arizona after being bred in captivity. Although their numbers have grown, there are still only 114 individuals living in the wild in the U.S. and another 31 in Mexico, according to the U.S. Fish and Wildlife Service (USFWS). Since 2003, the Chicago Zoological Soceity and Brookfield Zoo have collaborated with USFWS on its recovery program for the species, facilitating cross-fosterings of puppies born at the zoo and releasing one adult female into the wild who subsequently had her own litter of pups.